Today we go for something rather sophisticated but actually incredibly easy to make. On top of that, it is gluten-free and perfect if you are coeliac and doing bodybuilding. The recipe is not the quickest but it’s simple and straightforward. This would make you look like a master chef even if your biggest culinary achievement so far has been scrambled eggs. I would recommend this recipe to whoever has never tried making risotto since it’s very basic and simple and can help you getting started. Once you can master this high-protein risotto, every other risotto recipe is going to be a no-brainer and will add endless possibilities to your cooking repertoire. 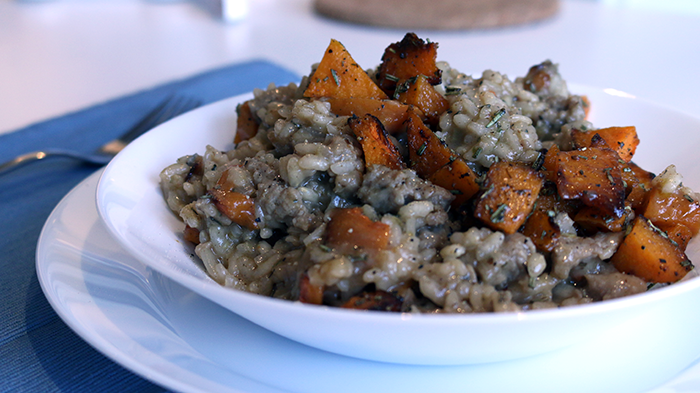 For instance, you could try this foodgasmic risotto with pumpkin and pork sausage. 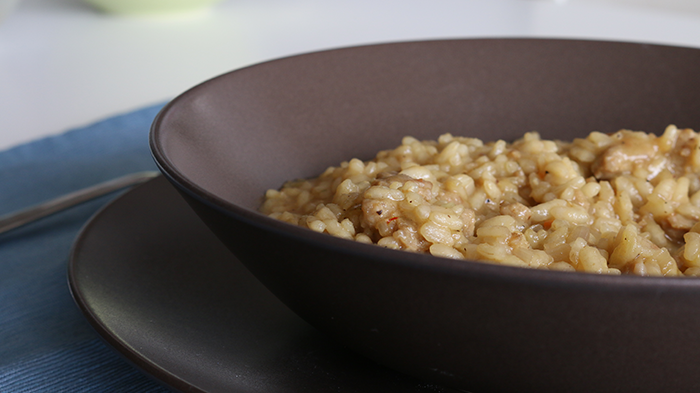 I love to have risotto as my post-workout because I can get in one package carbs, proteins, and fat with benefits of an incredible creamy taste. Great for when you are bulking and want to eat a lot of calories in a single meal! beef broth fresh/canned/bouillon. Keep it warm throughout the cooking on a second boiler. In a warm pan over medium heat, add 1 tbsp of olive oil. When the oil shimmers, add the chopped shallots. Cook until become slightly yellow. Add the chopped sausage and cook until not pink anymore. Add the rice and cook stirring until it becomes translucent. Add 2 tbsp white wine and let it evaporate. Add 1/2 cup of warm beef broth and stir. When the liquid evaporates, keep adding beef broth in small amounts (1/2 cup should be ok). Repeat until the cooking time of the rice is reached (or until you taste it and see that the rice is cooked). Add the butter and the grated parmesan and stir to incorporate. Let it rest for a couple of minutes and then serve with some ground black pepper.